Lindy’s favorite humbucker. Clean and articulate with very good note separation. The parts used look like real P.A.F.’s and the tone is as close as we can get. The Lindy Fralin Pure P.A.F. humbucker is Lindy’s favorite humbucker we make. Based on the specifications of the original 50’s Gibson® P.A.F. pickups, the Pure P.A.F. humbucker is clean, articulate, and clear. This pickup will give you a vintage, clean tone that’s more articulate than most modern humbuckers. The Pure P.A.F has a lower output, which is more dynamic and expressive than higher output pickups. 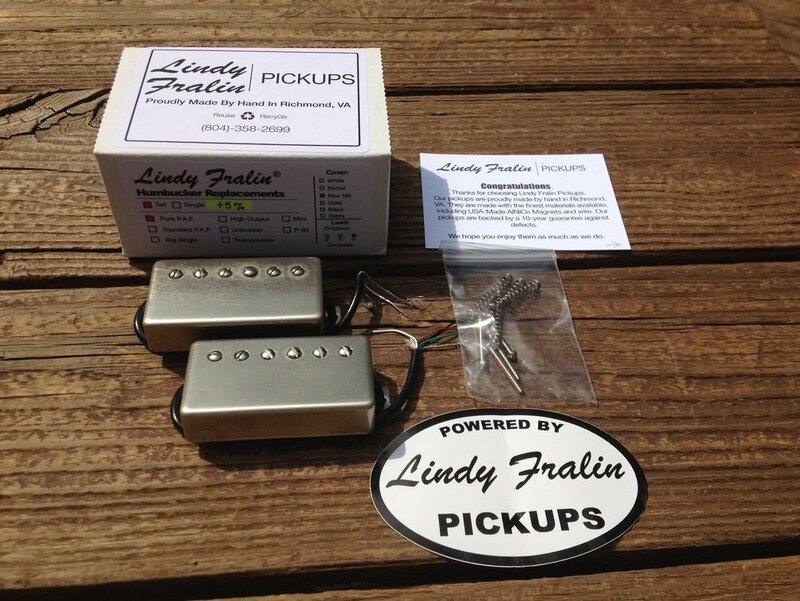 Lindy’s passion for the sound of vintage 50’s humbuckers led us down the road to design and create the Pure P.A.F., our most authentic-sounding humbucker. Clean, clear, and articulate. The Pure P.A.F. will stay clean as it won’t break up as early as modern humbuckers, and you’ll find that it’s loud, while still remaining clear. Built with AlNico II and 42-gauge plain enamel wire, the Pure P.A.F. pickup is a gateway to vintage tone, instantly. When playing clean, you’ll find that this pickup sings what you put into it: it’s extremely dynamic, clear, and warm. With distortion, you’ll find that the grind is nice and smooth, with a pronounced pick attack and pure-sounding plain strings and bright wound strings. Wound with 42-gauge plain enamel wire, and built with Alnico II magnets. Built to the 50’s specs: from the Butyrate bobbins, down to the baseplates and screws.